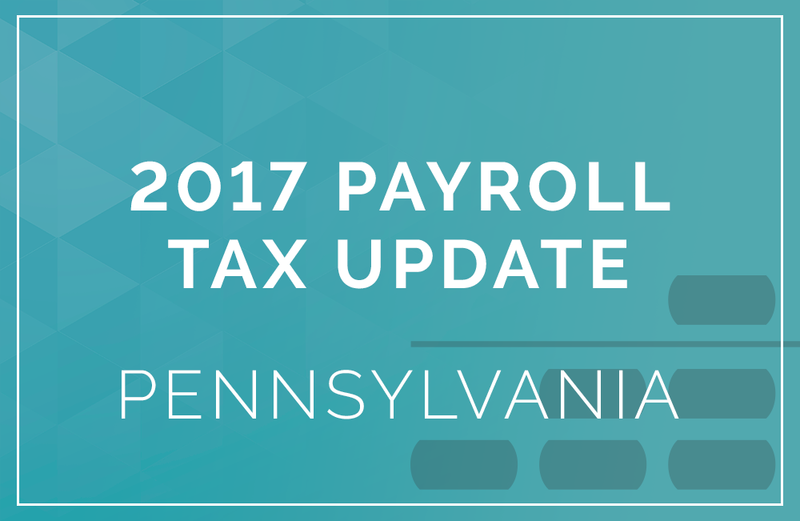 Here is a summary of all the changes to Pennsylvania payroll tax rates in 2017. We keep this page updated, but if you’d like to be alerted to more changes to Pennsylvania Payroll Tax rates in future, you can subscribe to our Payroll Tax Alert Service. The employee rate for 2017 is 0.07%. Wages subject to unemployment contributions for employees are unlimited. Wages subject to unemployment contributions for employers increase to $9,750. Effective January 1, 2017 employers are required to pay unemployment compensation (UC) contributions and reimbursement Statement of Accounts electronically if the total liability owed equals or exceeds $5,000 for a payment period. Effective July 1, 2016 tax rates are 3.9004% for Philadelphia residents and 3.4741% for nonresidents. These rates are adjusted by the City of Philadelphia on July 1, of each year. Act 32 is a law that reformed and standardized the local earned income tax (EIT) system, which requires uniform withholding of earned income taxes and local services tax with remittance to a single local collector or Tax Officer. For more information, see www.dced.pa.gov.